Sauron the Great, the Dark Lord of Mordor, has returned to his ancient fastness of Barad-dûr. This stunning game is a bit different in that it explores the period between The Hobbit and The Lord of the Rings. Instead of following the events of the books, you control new characters like a hobbit, a captain of Gondor, a hardy dwarf, or an elf. 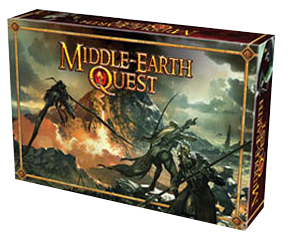 The core of the game is perilous questing, but of course one player is Sauron and has numerous minions and monsters at his command with which to foil the characters’ plans. In a way, it is a bit like two different games in one; but the ‘good’ and ‘evil’ game mechanics work beautifully together to create a memorable experience, even though it can sometimes end with a ‘Ringwraith smackdown’ ending. Combat is card-driven and atmospheric, and the game brings an entirely new perspective on the events of the books and widens the focus out into a world of adventuring and one-on-one combat. Definitely a stand out from the usual crop of adventure games.